You build barriers when you use the word ‘impossible’. Though invisible, these are very real barriers. Every time you repeat the word “impossible”, you tell yourself and the world that something cannot be done, and you put a wall around it. You build an invisible wall between you and the thing you say is impossible to do. 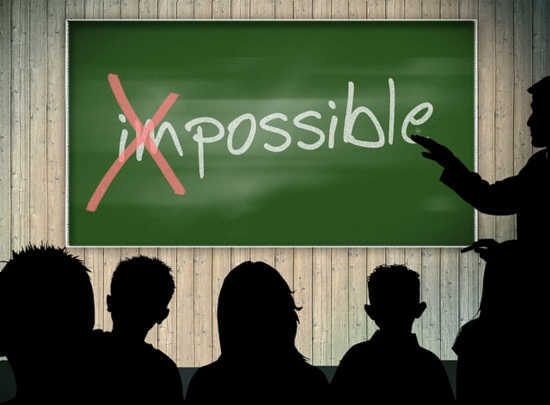 Removing the word ‘impossible’ from your vocabulary is like breaking up a wall that is holding you back from taking action and from achieving success. This word ‘impossible’ means the same as ‘I cannot’, ‘I don’t believe I can’, or ‘It won’t work’. These words and similar ones are like chains that tie you down. They show lack of self-esteem, lack of confidence and lead to lack of achievement. Take a moment to think how many times you have used the word ‘impossible’ and other similar words in your life, and how, by doing so, you created limitations. Think, how would your life look now, if you didn’t say those words? How many times you have said the following phrases? It’s impossible to get this job. It’s impossible to lose weight. It’s impossible to earn more money. It’s not possible for me to get rich. It’s impossible to learn French (or any other language). I cannot afford to travel abroad. These are just a few examples, and if you think a little, you will many more to add to this list. Every time you repeat one of the above phrases you are building a barrier. The more you repeat them, the more barriers you build, and the higher and stronger they become. These are mental and emotional barriers, but they are even stronger than physical barriers. They hold you back from trying, hide opportunities, and make you live in a limited world. You need to break these walls, and you need to stop building them. All you need is to change your attitude and start believing that everything is possible. 1. Stop using the word impossible and remove it from your vocabulary. 2. Stop limiting your thinking. In your mind, everything is possible. There is no one limiting how you think. It does not cost you money, time or effort to think about or imagine anything you want. 3. Everything starts in the mind. When you think of something as possible, and believe it is so, you see opportunities you never saw before. Believing in possibilities keeps your mind open and boosts your motivation. 4. Find small and simple goals or tasks that you deem impossible, and make it a challenge to change your attitude, think they are possible, and start right now of doing something to accomplish them. 5. Visualizing what you want and believing it is possible is not something difficult to do. There might be some inner resistance at first, but with some persistence you will overcome it. 6. Visualize a certain goal and believe it is possible. Repeat this thought over and again, and gradually, you will begin to believe in “possibilities’ instead of believing in ‘impossibilities’. This will change you attitude and mindset and would remove the ‘impossible barriers’. You will begin attracting to you new possibilities, success, happiness and a better life. 7. Read the success stories of people who did not believe in the impossible, and therefore, achieved the impossible. Th word ‘impossible builds barriers that you do not need, which limit your life and prevent you from achieving goals. Start making the word ‘possible’ you ally and partner to success. Affirmations – Words with Power.